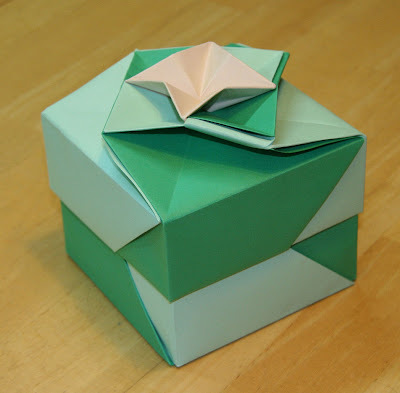 Here is a New Year's present for intrepid folders to try. This box began gestating on the last day of 2008. A visitor to my house noticed a box I have had on display for several years and asked if I could show her how to make it. 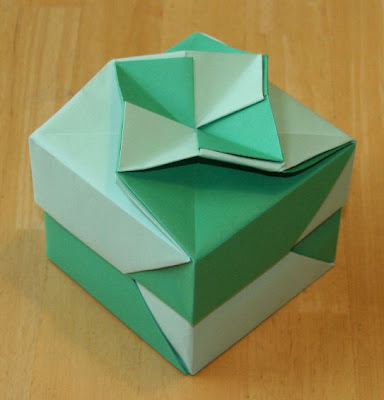 The original was a modification of original modular pattern designed by Tomoko Fuse. It was a creative recyling of American Letter-sized advertising flyers which had been printed on one side only. 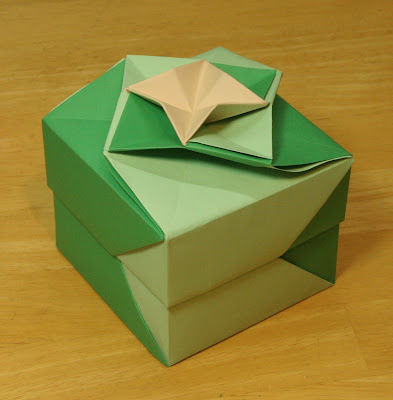 I put the printed sides together and made up the box and its lid from double thickness paper. The photo of the originals can be found on my photo site at http://photos.womm.org/origami in the recycling section. 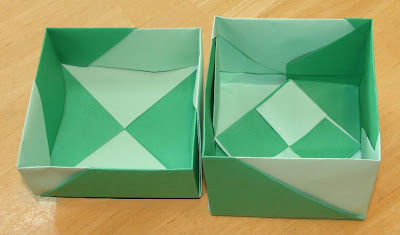 I took the box apart, re-discovered how I have made it and then taught my visitor how to make a similar one from a single layer of colored copy paper. After she left I found myself considering how the original box and its lid might be modified and improved. The original box has a slanted design on the lid which was echoed in the base section. Due to techicnical problems which I did not know how to solve back then, the slants were not at the same angle on the body as they were on the lid and they did not meet neatly when the lid was fitted on the base. I decided to redesign the box so that the slants on the box connect with the slants on the lid and both slanted at the same angle. This was not a simple problem because I was working with American Letter sized copy paper. In case you have not notificed, standard copy paper is not square, or even an integar multiple of square. 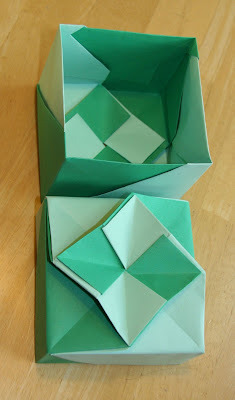 New Year's Day was spent folding and refolding prototypes until, finally, I came up with something which satisfied me. Here it is. I hope it satisfies you, too. Enjoy! Espero que todos tienen un maravilloso año nuevo or simply have a great new year. P.S. The reason for the color differences in the photos of this box is that some of them have been taken under ordinary lighting and some under sunlight spectrum lighting. The greener of the two was taken in the sunlight spectrum and more faithfully depicts the real color of the paper. Personally, I like the aqua color better.